A blog about a book . . about a blog. What with starting my own blog, and being a big fan of pretty much everything Star Trek, I have recently been checking out Wil Wheaton dot net. Best known in most circles as starring in Stand By Me and Star Trek: The Next Generation , Wil Wheaton is now best known in geeky circles as a blogger and published writer, and also as being a fairly big geek himself. 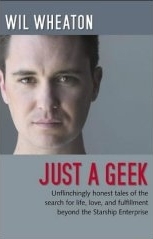 Hence the title of his book ‘Just A Geek‘. A book which I decided to buy and am really glad I did, as it is one the few books that I have read in one day, and possibly the only one I have read in one go. Based on posts from his blog, the book goes into often very personal detail about many things, most notably his personal battle with what he calls ‘Prove To Everyone That Quitting Star Trek Wasn’t A Mistake’, his need for ac ceptance and recognition for his own merits, which he often amusingly talks about in the second person. Chronicling certain events, Wil shares all aspects of his life including his struggles as an actor, the joys of living with his wife and step children, and his mixed reactions to the large impact of Star Trek and its fans. All of which makes for funny, honest and very compelling reading. Certainly the best book I have read recently, and almost possibly the best book I have read in a very long time. As anyone who lives in Britain, Europe, and possibly even the world will know, today is the hundredth day since Madeline McCann went missing. People will know this of course, because this news will have been shoved in their faces by nearly every newspaper/TV news programme throughout the whole day. Before anyone accuses me of being insensitive, I realise that having your child go missing like Madeline has done must be a harrowing experience, and I am not trying to rant about Madeline of her family. What I am going to rant about however, is what has happened since, and the way in which the media have turned a single child’s disappearance into what by now has to be the most extreme case of Missing White Woman Syndrome ever seen. Even David Beckham made an appeal after just eight days after her disappearance. Whilst I’m sure this was done from the kindness of his heart, was I asleep for his appeals about the countless other children who missing? Surely the number of children who go missing in this country is higher than most of realise, and the number in Europe higher still. So what is so special about Madeline to warrant all the attention?? The Sun newspaper was just one of several who focused on her story, but to their credit also focused on another story featuring a four year old girl. One was about a woman and her boyfriend who have been charged with torturing and murdering her daughter, another about a girl who went missing over three months ago, and which nothing has happened since. And which one got the front page spread???? Yep, Madeline. The other took up only half of page fourteen if anyone is interested. Somewhile ago, the front page of The Sun (again) stated that some cold hearted fiend had robbed Mr McCann of pictures of his precious daughter. When I read the actual article (I was bored) it turned out that what had actually happened was that someone had just pick pocketed his wallet. Something else that happens everyday and doesn’t warrant front page attention in the slightest. It wouldn’t be quite so bad if they at least did it in proper English. The front page on The Mirror today explains how ‘Madeline’s Parents Tell Police: Where Is The Proof She Is Dead?’ I expect these journalist types are more qualified than I am, but surely that wasn’t telling, that was asking. And I know I said I wouldn’t rant about the parents, but as heart breaking as losing a child must be, it has to be noted that they have since been on a European tour, met the pope, and achieved a minor celebrity status. And all because they were too irresponsible/ignorant to let a creche look after their child. Basically, it all boils down to the fact that no matter what is going in the world, the media will still choose to cover whatever the hell it wants/needs to in order to maximise its own profits and/or send out it’s own ideological propaganda, and then attempt to make it sound important enough to warrant placing so much attention on it. And the truth of the matter is that pictures of a missing girl will sell newspapers. As long as she is photogenic, white, and comes from a wealthy background that is.